The moment I left my mortal body, instantly I received a perpetual form which did not know any earthly grief at all. Knowledge was getting seeped in so fast in every pore of my eternal happiness divine body, as if the whole universe was getting gravitated towards my body like a magnet and getting absorbed into me, due to which I was able to experience the knowledge of the rare Divine Truth very fast, even beyond the pseudo Archaic limits of nature, as if my old memory lost many years ago was coming back at a light year speed. In fact, knowledge of truth is endless similar to limitless entity of Omnipotence but due to this very fast wonderful process of knowledge getting incorporated, even in that short time I acquired profound knowledge as compared to an average human being, however, till that time I did not have an idea that even beyond that acquired special knowledge, God Himself had made an arrangement to provide me supreme knowledge and memory. During this divine process of absorption, I saw two divine deities in front of me who were standing happily towards me with both hands joined. Pointing towards a divine aircraft those deities said to me, O Lord, please sit in this plane, we have been asked to bring you along with us. Then I told those divine deities, I will come with you but my kinsmen (wife, children) are not at all different from me rather they are integral part of my body itself because they are guileless and have pure heart like me and they love me way more than their own lives, and because of that, I am afraid that after getting separated from me, this cultured family, which has ability to help countless other people, will get burnt in unbearable fire of torment and may get shattered immediately. Being questioned by me like this, those divine deities started smiling. Then those divine deities said with a highly affectionate gesture, please come with us without worrying, as far as we know, your God whom you worship has done some special arrangement for this as well. Then I sat in that strange and picturesque aircraft. The aircraft travelled very fast and reached to a kind of divine planet whose origin or end of its dimensions were not visible. The planet was beautiful beyond imagination, attractive, full of joviality which I just kept on watching enchanted. There, neither Sun nor Moon or any other light source was visible but despite there was a kind of supremely amazing situation which cannot be understood by a man who doesn’t possess yogic power because neither there was light nor darkness but despite that everything was crystal clear. Upon asking the divine deities, I got to know that this planet was nothing else but the unattainable Golok, which is inaccessible and unreachable even to the deities or to Lord Brahma Himself because this planet is an own residence of Owner of infinite universes, Shree Krishna. My aircraft started moving towards a huge mountain which was visible from very far. When aircraft reached nearby, we got to know that it was not a mountain but a huge palace actually. After alighting from the aircraft, when I reached the gates of that unimaginably grand palace, I saw some grand and very beautiful residents (men and women who were as majestic as the divine deities who accompanied me) were happily preparing for some festival. I asked the residents there, which festival you are preparing for and whose palace was it? They told that a special guest was about to come there and we are preparing to welcome him and this palace was of Shree Krishna. Then I asked those people who is that special guest and where is Shree Krishna? When I asked this, residents there smiled and said to me, your question will be answered by those people and by saying that they gestured towards some special people whose bodies were even more radiant than the residents there and were shining like a celestial lightening. I observed that my body was also shining brightly with tremendous radiance like those special people. and tell about the preparations going on here and who is that special guest and where would I find Shree Krishna? On being asked this by me, those special people also smiled and they responded that first, you are not new here. You were always a resident here and will always remain one however, in between, even Shree Krishna has to leave his own residence for incarnation on Earth and other planets for the fulfillment of specific objectives. Exactly in the same way we have to go as well but eventually we return to this place where our eternal home is located. Answer to your second question is that these preparations which are going on to welcome the special guest is none other than you. Answer to your third question is that to have the realization of viewing Shree Krishna and for that rarest opportunity of meeting Him in person, please enter inside this palace. I was amazed to hear their words, are these welcome preparations really for me, then I moved towards entrance gate of the palace and gatekeepers got me entered inside with great respect. 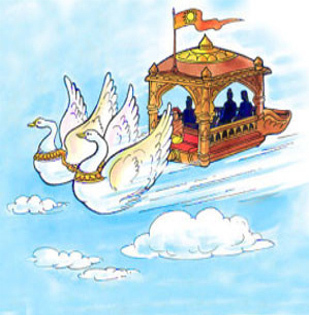 After that while standing inside the palace in the state council and looking at the empty throne, I was thinking that the throne is vacant then where is the God Shree Krishna? At that time, state council was full of divine men women and all the royal courtiers were looking at me with a mysterious smile. Suddenly I felt that someone was standing exactly behind me. When I turned back immediately and visualized, I started floating in the ocean of wonder, happiness, adventure and excitement because right behind me Shree Krishna who is without beginning or end, an ultimate companion, was standing in his quadrangular form. 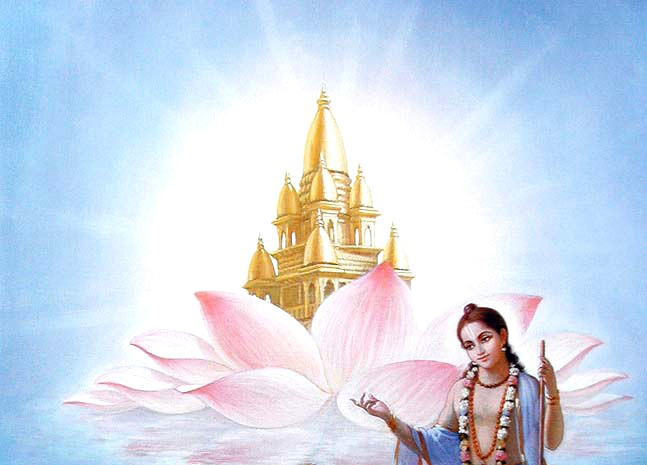 The whole universe looked like getting contained in Him, His eyes were the ocean of serenity, there was that incessant majestic smile on His face that turning the eyes away from Him was impossible, from one palm of that divine body, was a continuous gold dust falling down whereas there was a lotus in another hand. After gracing me with the incredible fortune of viewing His majestic form He held my hand in His hand and made me sit on that throne and then Shree Krishna, sat on the throne which was exactly below my throne. After giving this great honor, Shri Krishna played the role of Guru himself and imparted the supreme knowledge to me. In the end, He explained me the meaning of that divine sentence (ekoham bahusanm) that in these infinite universes, only and only exist, nobody else is there. He told me that every resident sitting here is Him only. As soon as He said this, each courtier’s body dismantled in the form of whirlwind and got absorbed in Him. After all courtiers got absorbed in Shri Krishna, He said to me, you are also not you but Me only. As soon as, it was said by Shri Krishna, my body also turned into a tornado and was absorbed in Shri Krishna itself. As soon as my body got absorbed in Shree Krishna, I immediately got the self-realization that I am myself Shree Krishna. Then I started observing as a witness to this infinite, vast world made by nature. 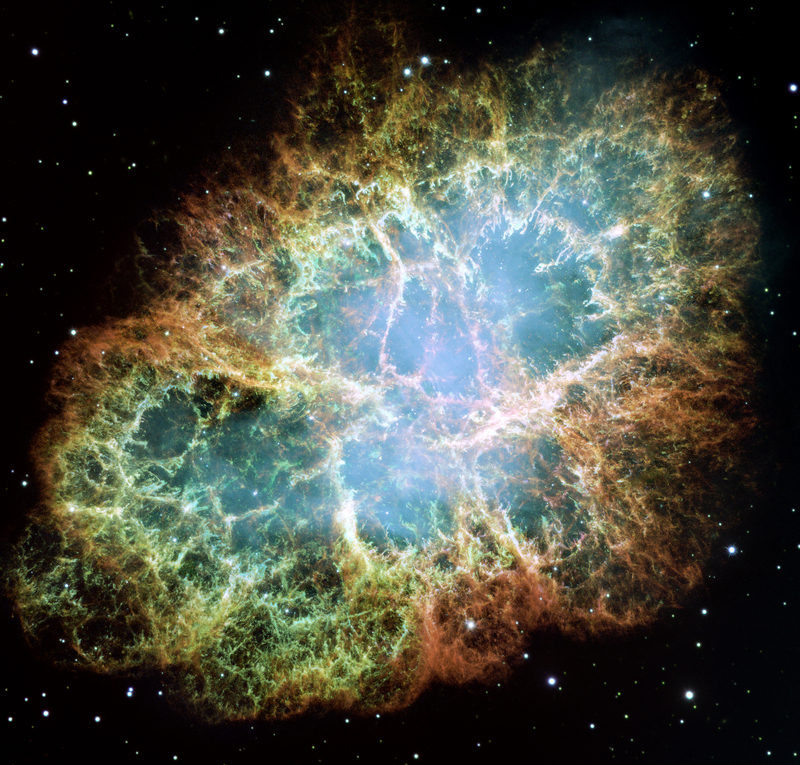 Infinite universes and this small planet Earth situated in it also was getting visible inside in my body. Process of observing this same infinite dimensions of formless God (which is in an inseparable state of nature) is called exploration by some whereas, some call it endless process of self-realization. 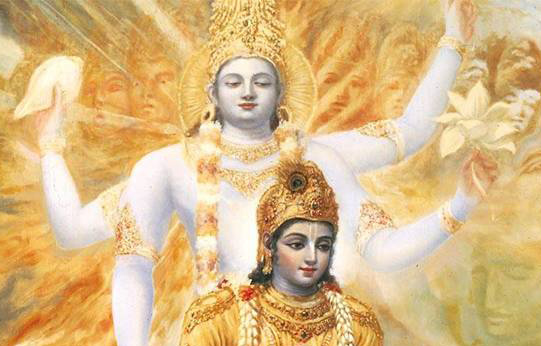 Whether it is Sri Krishna or Shiva or Narayana in the form of reality, everyone does the same. After absorbing me in Himself, Shree Krishna appeared again in dual form i.e. got separated from me and He said to me that many important activities need to be completed by you on Earth. So, you live with your kinsmen in this divine form on Earth and after receiving the supreme knowledge you have become my own self. So, every thought of yours is my thought now, your each words are mine now, every action you make will be an action done by me. So, you go and determine the direction and condition of the upcoming great changes.